Well without a doubt, they have some striking (pun intended) similarities that we will eventually discuss. But the differences are quite vast. The fighters that participate in each sport are not necessarily interchangeable. For instance, John is your typical Boxer. John would have a hell of a time trying to compete with a Muay Thai athlete. However, Ron would have very little trouble transitioning from Muay Thai to boxing. In fact, it is arguably less work! If John went after Ron… there would be some dire consequences for the unfortunate boxer. The importance of knowing the differences from a boxing background can help you understand more fully how to effectively apply rules and moves in Muay Thai sparring. But it isn’t all doom and gloom for boxers taking a shot at Muay Thai. There are things that can translate quite well from boxing that will certainly help out in Thai boxing. So let’s dive into these main differences. When it comes to stances, there are some fundamental differences between boxing vs Muay Thai. Notice how the feet in Fig. 1 almost positioned in a way that braces the fighter. The back foot is turned in a way that can seemingly withstand a bull rush. However, the Muay Thai Footwork is more open. The main reason for this is that since Muay Thai Boxing is so geared toward kicking, the fighter must be light on his feet. The 2nd stance lends more to this because of the distribution of weight. For example, it would be much harder for someone like me to life my right foot to deliver a devastating kick if most of my weight is on the back foot. With the stance, the way it is in Fig. 2 almost either foot can come up for a strike at any time. Unlike boxing where your punches power almost entirely comes from your legs and their placement, in Muay Thia the stance is more forward and square. With this stance, you are able to deliver rear kicks, check kicks, lead kicks. As mentioned earlier, a Muay Thai fighter needs to be able to shift his weight quick and in a hurry. The stance with your legs is crucial in this aspect because in boxing the stance is more narrow than in Muay Thai where it tends to be more like a box. Due to the positioning of the feet and legs, this affords the hips to be very square when it comes to Muay Thai. However, in classic boxing, the hips are placed in a way to deliver more force with punches. So they tend to face away from the target. Since the boxers hips are mainly facing out at an angle away from the target, the affords boxers more freedom to move, bob, and weave. This is perfect since that is essentially what a boxer does to protect them. But there is also no chance at receiving a kick! Notice the angles of the hips. This is all necessary to preserve the quickness that is needed when getting ready to protect or strike. It goes without saying that hand positioning in Muay Thai vs Boxing is completely different ideologies. They all make sense for their prospective sports and fighting styles, but the differences are night and day. In boxing, your hands are in place to protect your money maker, your face. Any fighter in any arena can tell you that no matter how big or how strong a guy is, you hit him a few good times to the head and they all come crumbling down. Boxing has a high need for its heads because the main focus is to beat that head into a pulp. Ignore the terrible crudity of the image, but focus on the hands and the placement. Becuase of the mixed bag of attacks you get in Muay Thai, this stance will protect you pretty well from elbows and head kicks. Which most time is an automatic KO if you are unable to withstand it. Notice how the front hand and back hand, even though the elbows are apart, are close to each other. This helps defend against kicks and jabs to the face. Another cool thing is that this also has an offensive benefit keeping the hands so high. You are much more able to deliver quick elbows since the hands are likely in a place to strike quickly. in boxing, footwork is pretty essential. Think Muhammed Ali floating like a butterfly. He was simply amazing at it. This afforded him lighting quickness and the ability to dodge very quickly. If you really think about it, it is a dance. In boxing, the constant bouncing and reacting to opponent movement, it is a choreographed dance. Now, Muay Thai is a bit different. 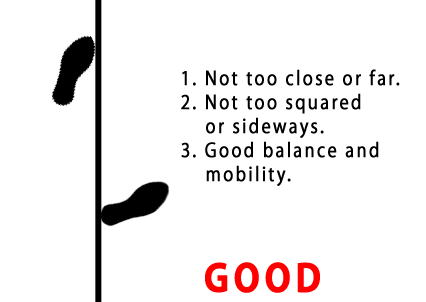 As a result, footwork in Muay Thai is kept simple. As mentioned earlier with foot and leg positioning and stances, the weight distribution also plays a role to the classic stances we see in Muay Thai. The ability to deliver and dodge quickly from all types of attacks lend well to you winning the match. You are reading here because you likely had an idea to begin with that the two are different. Unfortunately, it is widely accepted that the two sports are the same. Muay Thai and Boxing are very different sports. Due to what is allowed in each, certain stances and positionings are necessary to protect you as a fighter. I hoped you have learned that Muay Thai and Boxing are very different sports with very different priorities. Due to what is allowed in each, certain stances and positionings are necessary to protect you as a fighter. Due to what is allowed in each, certain stances and positionings are necessary to protect you as a fighter. Now with that said, having a background in both does not hurt. Even when you are specifically training to learn Muay Thai techniques, boxing fundamentals can give you a proper basis to fill in the gaps. I like to think of boxing like checkers and Muay Thai as chess. Checkers is has a lot of strategies but is basically one thing… skipping over pieces to eliminate your opponent. Chess is a thinking man’s game. With so many pieces that can do so many things, you have to account for all of it. Same with Boxing vs Muay Thai. Boxing is the one trick pony and Muay Thai is the whole kitchen sink, then some! Check out more techniques by reading up on Muay Thai by clicking here! Please join the discussion and comment down below! What do you think? Be sure to comment down below and let me know how you feel the sports are different? or is there even a difference at all? Also be sure to check out more up to date blog posts here! The Hayabusa Tokushu Regenesis Boxing Gloves are so revolutionary because they provide outstanding protection to your hands. One thing that any fighter or trainer knows is that without the right set of gloves, after some time, you can really damage your hands. But these boxing gloves are proven to show your hands the respect you deserve so that you can go back to doing what you normally do after your workout pain-free! These gloves are for beginners and Muay Thai Boxing Enthusiasts! These Thai Boxing Gloves Do Not Limit Movement! These punching gloves actually become a part of you. Research has shown that many people forget that they even have them on when training, which is a great feeling to have when you are punching away at a bag. Comfortability is paramount when using gloves. You do not want unnecessary pain when you are grinding away at a set. SweatX Thumb Sleeve is a Remarkable Feature That Sets these Glove Apart from the Rest! This innovative feature is a microfiber suede material that is specifically designed to handle sweat and perspiration during training. Because of where the thumb is located in the glove, the position of it eliminated the strain that is common to other gloves. If you have been sparring or boxing for any length of time, you are well aware of the pain associated with your wrist when you strike constantly. I remember when I first started, I had an issue with wrist pain after my first session (hurt so much, I almost quit! ), however, after my wrists got stronger, it no longer became an issue. So I kept grinding away at it and it worked out. I would want no one to have to go through that same experience. With Dual-X Wrist Closure that the Hayabusa boxing gloves provide will help you to avoid the pains that are associated with it or at least greatly diminish it. In fact, Hayabusa boasts that your wrist will be in 99.7% perfect alignment! These pro boxing gloves have been tested over and over again using axial pressure sensors. These sensors help define what is needed to guard against harmful and/or unnatural extension, flexing, and twisting of the wrist. It’s Official, Your Hands Will Thank You for these Pro Boxing Gloves! Understandably, most fighters that are getting into Muay Thai Boxing, going to the gym 4-5 times a week is normal. So you will be spending a lot of time on the heavy bag. Many wearers of these Muay Thai boxing gloves have reported that the Hayabusa Boxing Gloves have an inner fabric called X-Static XT2. It is a silver-ion, anti-microbial technology. In laymen’s terms, it will help guard against bad smells. The mesh also proves ventilation and breathability as well as thermo-regulating support. Be sure to be surprised when you slip your hands into these babies. Final Verdict: Are the Hayabusa Boxing Gloves Worth the cost? Whether this is your 2nd or 3rd pair of gloves, or your very first, The Hayabusa Regenesis Boxing Gloves prove time and time again that what you are doing is the right call for your health and safety. You can skimp on the short, you can skimp on the shin guards. Do Not skimp on your gloves. They encase 2 of the things that will make you money from now on, your hands. Available Now! You can get these great Thai Boxing Gloves with free shipping! You are just days away from having these puppies in your hands and taking on the bag with confidence and safety. Click the link below or any links on the page. Q: Where to buy these Muay Thai Gloves? A: You can get them directly from Amazon.com using this link. Q: How to clean Hayabusa Boxing Gloves? A: The soft leather of the gloves are in many ways better because you can use regular Lysol or baby wipes to wipe them down. A: Yes! The gloves come in multiple sizes. Depending on your hand size, you can choose the gloves that best work for you.